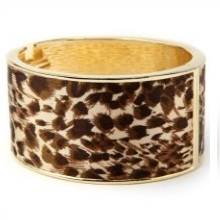 Bold, oval cuff bracelet with leopard print, silky-touch fabric wrapping. Goldtone accents and interior. Snap cuff closure. Customized in size and scale for the plus size woman.